Online clothing business is a popular business model which definitely can bring good income. But competition in this niche market is rather high and sellers have to think over possibilities to make their business outstandingly better. A good solution here is to give customers a possibility to design their own clothes online (t-shirts, polos, hoodies, caps) and order them through a shopping cart. This functionality can be realized with the help of a special programming module — T-shirt design tool which is possible to embed into an existing e-commerce platform or you can purchase a ready-to-use T-shirt design software to start online clothes business from scratch. If you hesitate in taking a decision, read ahead, this article is written to help you understand all advantages of starting online clothes business with a t-shirt design tool and difficulties which you will face at the start. 1. It's a good way to make your business unique. Just compare how many online clothes shops are available on the Internet and how many of them offer online T-shirt design possibility. If you want to lead your online business within your country only, conduct a simple research via the Internet to find out how many competitors you may have. It is highly possible that there isn't a good online store in your country that allows customers to design clothes online. So why not take this niche? Due to a low competition, you have all chances to gain a proper reputation and make your online store name catchy. 2. It's a good way to satisfy even the pickiest customers. All people are different in their taste and preferences. There are lots of picky customers who don't like mass production clothes and search for something unique. Your custom T-shirt business is a real opportunity for people to make and buy unique creative design which will 100% meet their taste. T-shirt design tool built-in your website will give a great field for one's imagination and satisfy the needs of the pickiest customers. 3. 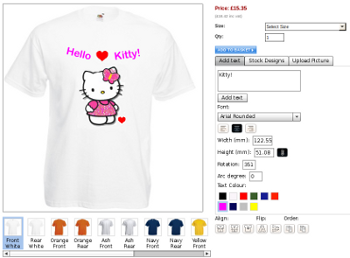 Being an administrator of your online store, you can create designs yourself and offer them for sale. By offering eye-catching designs you may demonstrate your customers how powerful online T-shirt designer can be and what results can be achieved. You probably know that there are some reputable online stores where every customer can make his own design and offer it for sales such as Zazzle, Printfection or Cafepress. If you have a featured enough shopping cart platform with a T-shirt design tool possibility and your personalized T-shirt printing business is up and running, you also can turn your custom T-shirt website into a marketplace. 4. Your custom T-shirt online store can be a perfect source of creative presents. Many people rack their brains every time trying to think out what birthday present to make for a best friend. Online store where every person can design clothes online is a good solution. A customer can make a shirt online which will meet his friend's taste or sense of humor. It can be a t-shirt with a friend's memorable quote, t-shirt with a funny photo and other ideas. Such personalized t-shirts are always pleasant to receive as a present. 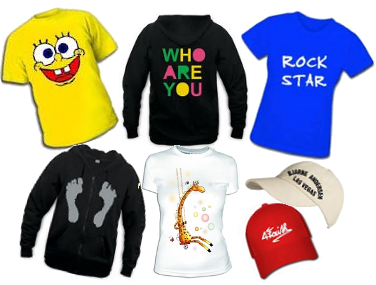 Custom clothes online store owners can promote their business as an unlimited source of such presents. So, we see the benefits but technical part of all the process is still vague. Let's figure out the difficulties that you are going to face. 1. What t-shirt design software to choose? Where? If you don't have a website so far and thinking about starting a custom t-shirt online store you should turn to ready e-commerce solutions – a shopping cart platform plus a design tool. Alt-team offers affordable in price Product design software which includes fully-featured CS-Cart e-commerce platform and the Product designer tool. If you have chosen a good platform for your online store, all questions regarding payment or shipping methods will be solved by itself. 2. How to print custom orders? You may print custom orders by your own means or find a company who do quality printing and make a contract with them. If you would like to offer your customers various personalization possibilities such as "design your own t-shirt", "design your own cap", "design a mouse pad, a mug, etc. ", you'd better choose a third-party printing service because printing on different surfaces may require different equipment. If you are going to sell one kind of customizable products, t-shirts, for example, you can do personalized t-shirt printing even at home, you just need to choose a printing technique and purchase special equipment for it. We have an article specially devoted to this issue Choosing a printing technique for custom T-shirt printing business. 3. Where to buy t-shirts? If you live in a big city, there is sure a wholesale store around where you can buy plain t-shirts in bulk for a reasonable price.If you don't know about such a place, the following list of international wholesale stores can be helpful to you. www.qtag.com - shipping within European countries. You may easily google for “blank t-shirts in bulk” in your country. When you find the company you want to purchase from, call them and set up a wholesale account. 4. How to attract customers? Sure, you will have to promote your service. To create an excellent strategy, you should find smart ways to balance a paid promotion with free promotion. All traditional marketing methods will do fine - advertising in printed media and online resources. Also, don't forget to join and participate in forums in your niche market and place news about your store in social networks, nowadays you have all chances to find your customers in there. Also, you can attract customers by making appealing promotional offers such as - order 3 custom t-shirts and get a present (it can be a calendar, a bag, a mug with an interesting design, etc). Hope, this article can help you to take your decision about starting your own apparel store with a T-shirt design tool. Online store with personalization possibility is actually a good business model which can high-demand your business and increase your profit. "I'd venture that this atircle has saved me more time than any other."